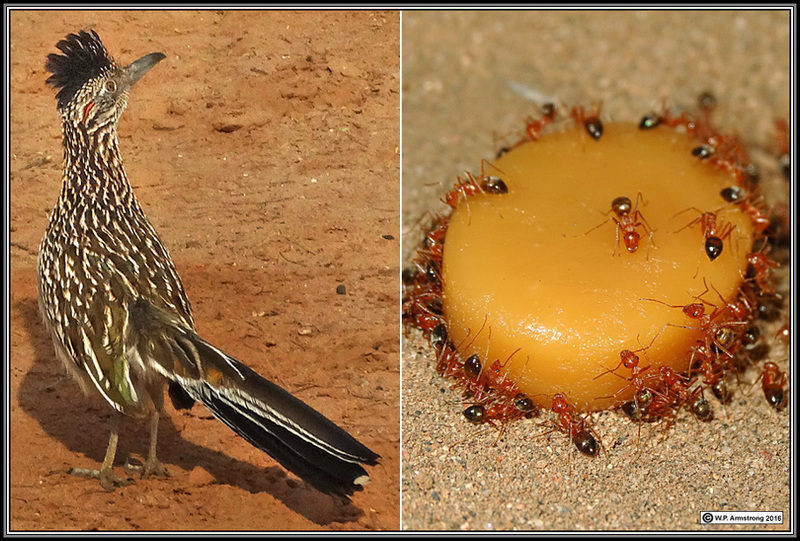 This curious roadrunner stood 10 feet away watching me photograph a colony of honeypot ants (Myrmecocystus) in the Lower Salt River. 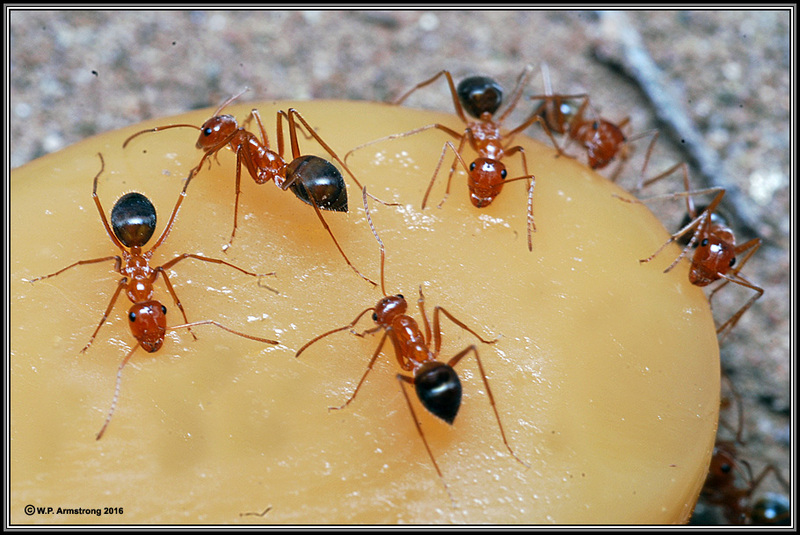 These ants are very fond of Werther's Butterscotch! 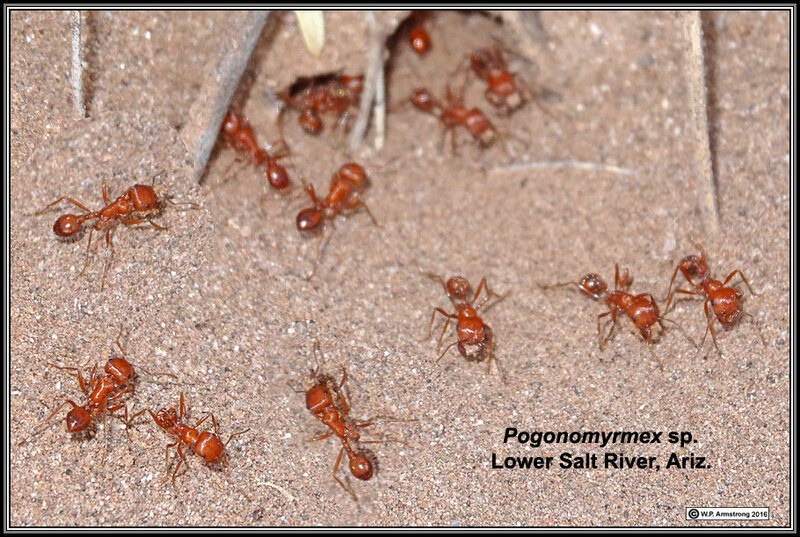 Close-up view of bicolored Myrmecocystus in the Lower Salt River. It belongs to the diurnal subgenus Endiodioctes. 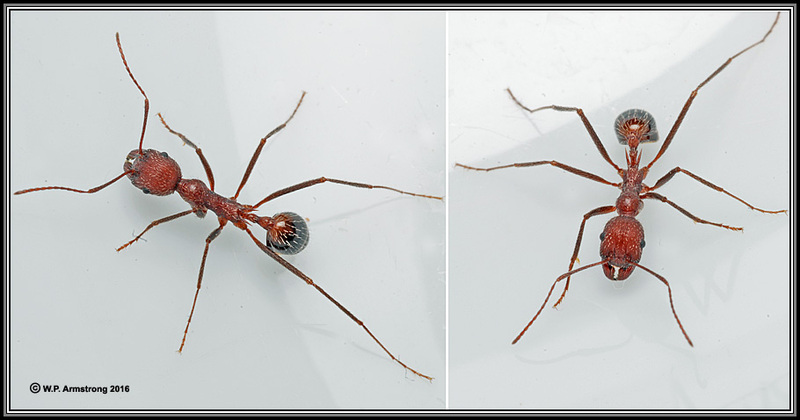 The bright red head probably rules out M. mimicus. Tentatively, it resembles M. mendax. 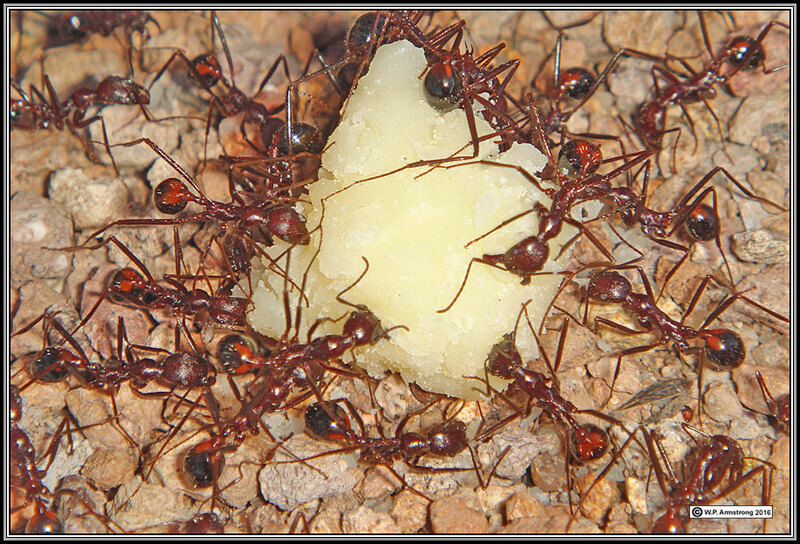 A yellowish or brownish yellow, unicolored honeypot ant in the Superstitions. 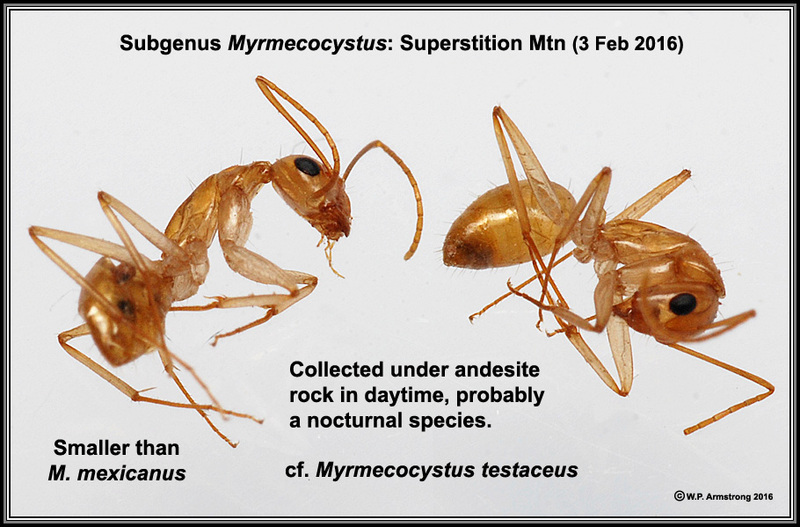 It belongs to the nocturnal subgenus Myrmecocystus. Tentatively, it resembles M. testaceus. 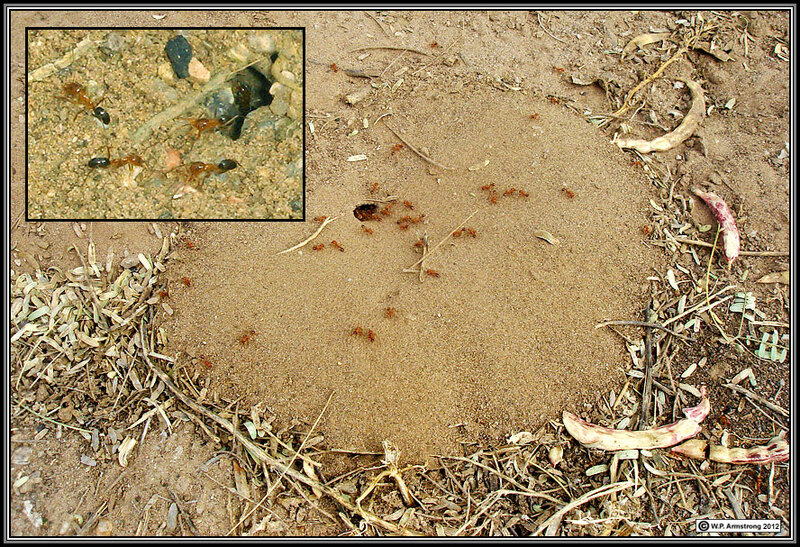 Some colonies of harvester ants (Pogonomyrmex) in the Lower Salt River are very dark with larger heads. These may be P. rugosus or possibly hybrids with P. barbatus. 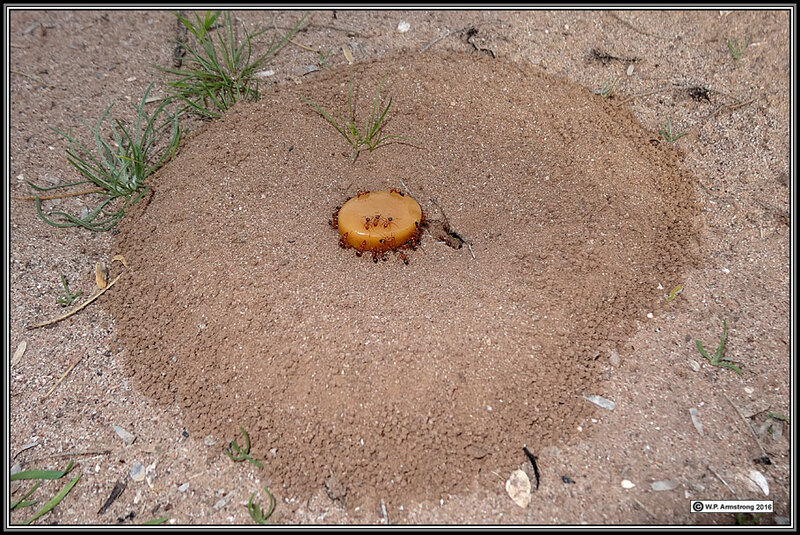 Nest of small mound-building ants of the genus Dorymyrmex (cf. D. bicolor). 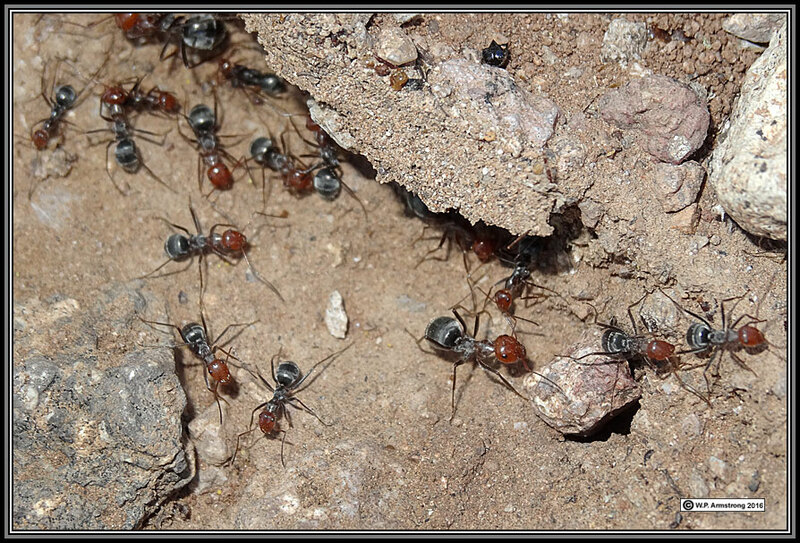 Acrobat ants (Crematogaster) in the Superstitions. 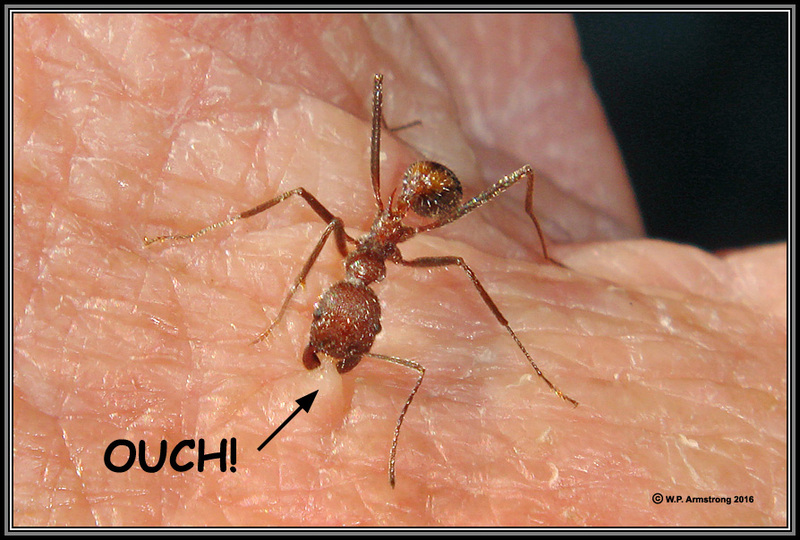 The name "acrobat" refers to the flexible way that a worker holds its abdomen (gaster) up over the rest of its body. 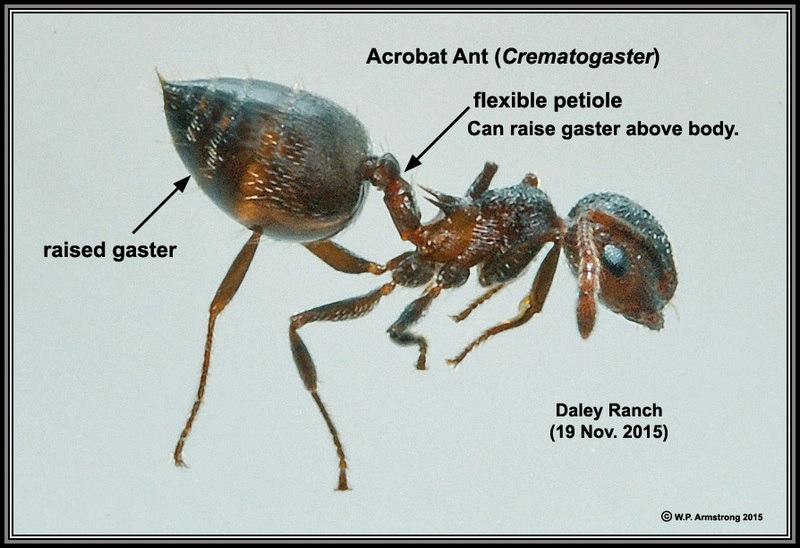 Crematogaster californica at Daley Ranch: The name "acrobat ant" refers to the unusual way a worker holds its abdomen (gaster) up over the rest of its body by a very flexible petiole. 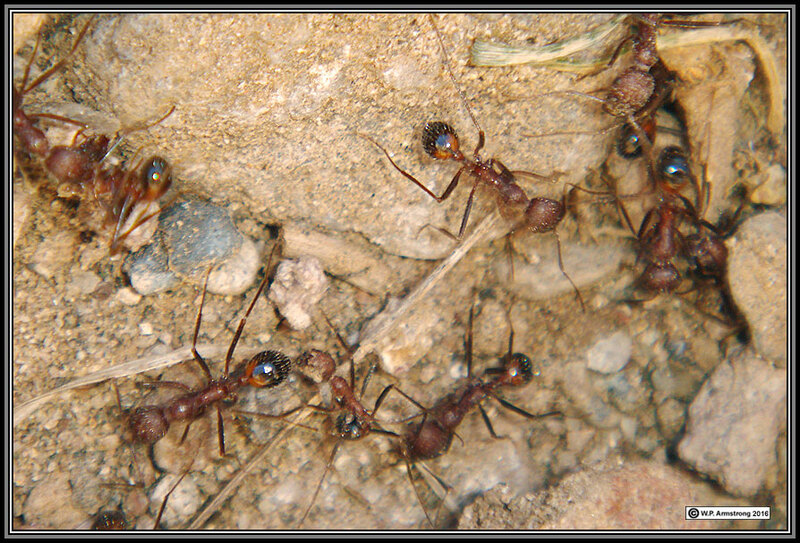 Long-legged ants (Aphaenogaster cockerelli) in the Superstitions. 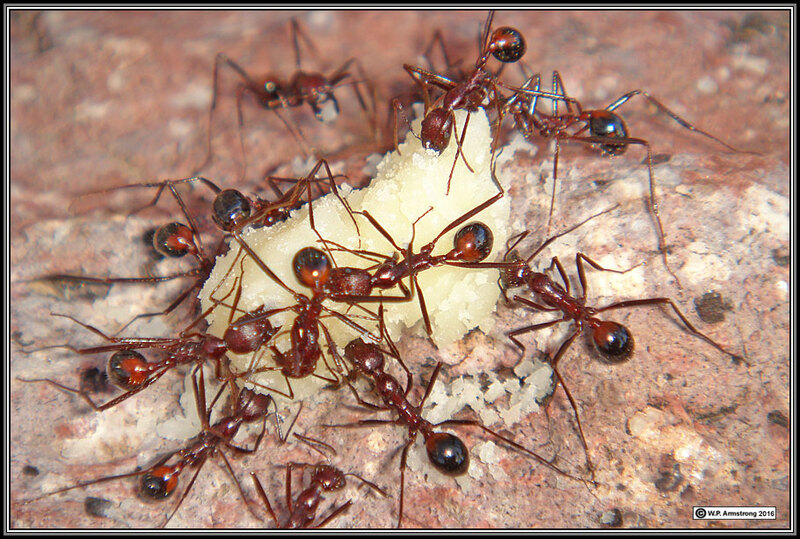 These large, friendly ants were enjoying a piece of cheese, a food they probably have never tasted before. 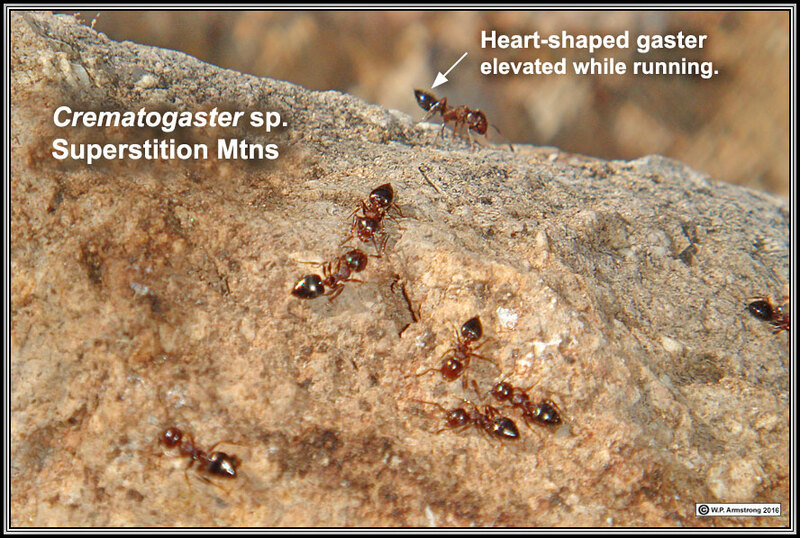 Possibly Aphaenogaster albisetosa: These ants are very similar in general appearance to long-legged ants (A. cockerelli) in the Superstitions and Sedona. 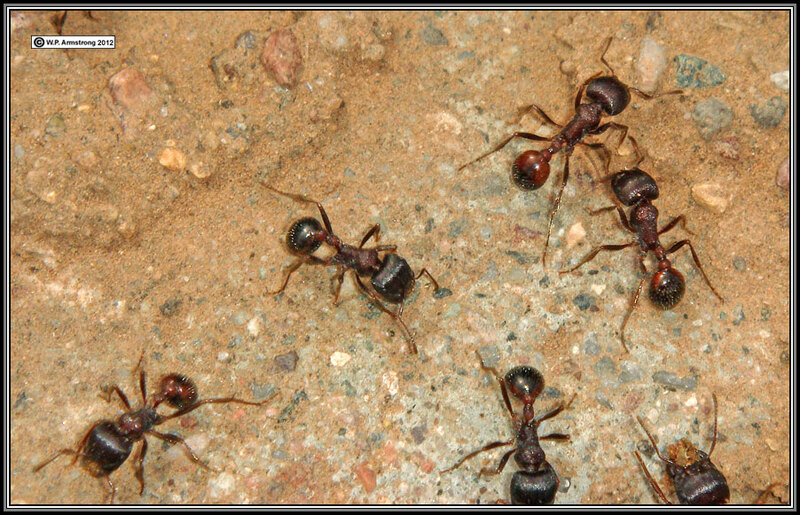 They appear to be more aggressive than A. cockerelli and bite without hesitation. This is especially true when I place my hand near their nest! 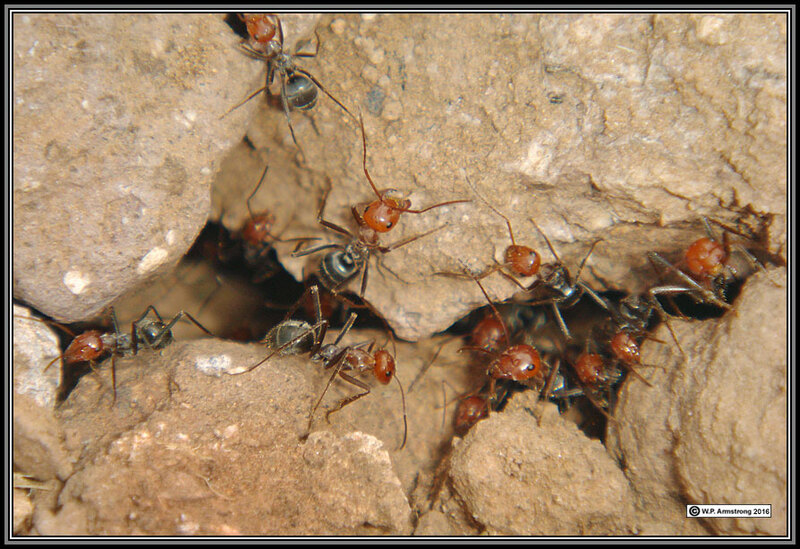 Field ant major and minor workers (Formica sp.) in the Superstitions. This species moves in a jerky motion and does not trail. At first I thought it might be a Myrmecocystus, but it showed no interest in my Werther's butterscotch candy, its maxillary palps weren't long enough, and its nest entrance was unlike those of Myrmecocystus. 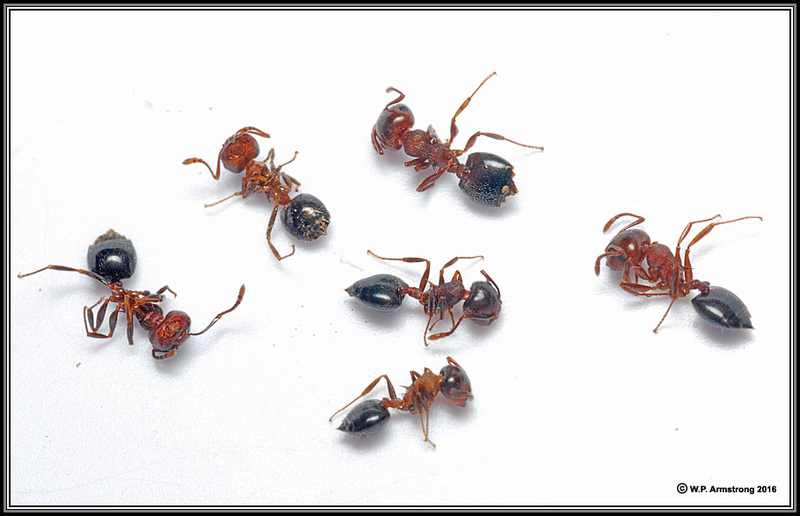 With over 100 North American species, Formica species can be extremely difficult to identify. 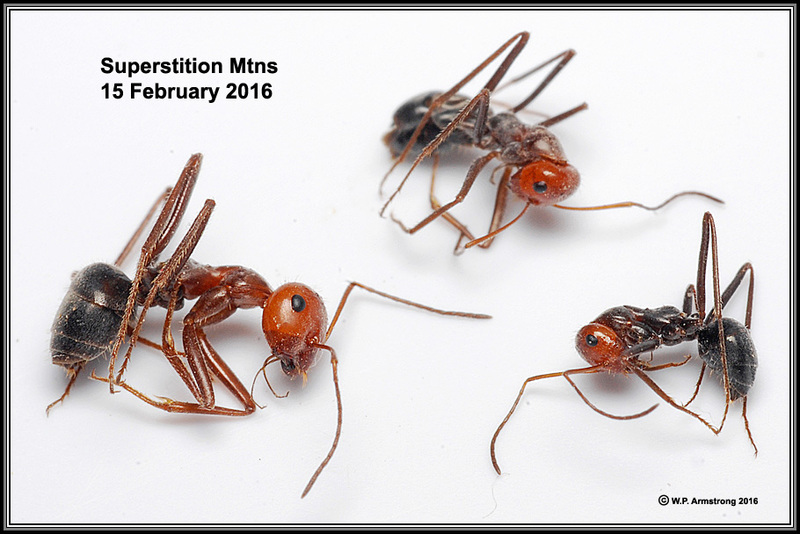 Desert field ants F. perpilosa and F. wheeleri have been reported for Willcox, Arizona.